10. Begin the “end of life” discussion. - Is a display window necessary? The more materials you combine the harder it becomes to recycle. - Does the packaging have to be easy to dispose of, is it akeepsake, or both? - Does it need to be reusable and/or recyclable (or simply recyclable)? Your packaging will not live forever, early consideration must be given to its end of life, this includes understanding the recycling process, disassembly design, compostable materials, and reusability. These 10 questions should serve as a starting point to develop your own line of questioning. This list is not meant to be interpreted as hard and fast rules that may limit on your creativity. There is no ‘right’ way, there is only what works best for you. The goal is to set parameters for structure, materials, production, fulfillment, and have a general sense of budgets so you can consider all aspects of packaging through your process. - What will each SKU retail for? - What is the budget per SKU for packaging manufacturing? Retail pricing helps to establish the level of interaction required, while the packaging budget will help to select or eliminate materials and manufacturing processes. 3. Understand economies of scale. - What will the initial order quantity be per SKU? Similar to budgets, quantity allows you to eliminate materials and processes as many specialty materials and processes have minimums. Work with a manufacturer who can help you navigate materials and processes if you are unfamiliar. It is as critical to design within the realities of manufacturing and client budgets, as it is to design with end user in mind. - What is the launch date? - What is the fulfillment timeline? - How much time has been allotted for transportation? Understanding processes that impacts timelines allows you to back out an executable time-in-action schedule, defining the true amount of time you have within which to create. Knowing your material and process limitations forces you to consider what is available, and create structures that exploit those parameters beyond what is expected. 5. 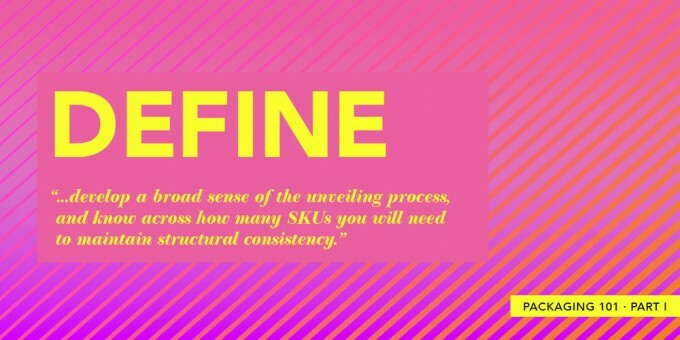 Define the fulfillment process? - Will the packaging be fulfilled by hand, machine, or both? - What are the machine requirements? Well-designed packaging can reduce fulfillment costs that can be reinvested into the consumer experience. Making sure to request ample product to test your own version of the fulfillment process will inform your decision making when you begin the prototype phase. - How many SKUs are you being asked to design? another, and what is their hierarchy? - What are the products made of? How delicate are they? - What is the weight of each component to be packaged together? You can begin assessing the complexity of the package to be designed, develop a broad sense of the unveiling process, and know across how many SKUs you will need to maintain structural consistency. Another critical bit of information gathered is if you are working on primary or secondary packaging, or both. The goal of defining your project in this manner is to have a clear understanding of everyone else’s role, needs, and the parameters within which you are able to create. Now that you have a broad overview of the packaging design and have set up parameters, it’s time to further refine those guardrails. - Where will the product be manufactured? - Where will the product be fulfilled? - Where is the final destination of the filled units? - What are geographic compliance laws for packaging and labeling? Geography plays a vital role in design. Not only does it impact timelines, but environmental factors from humidity to long transportation routes can define material needs that are often left to chance. There are many geographic factors that need to be taken into consideration when developing packaging. - How will the product and packaging be transported? Rail, truck, ship, or donkey? - Will they be shipped together, separately to be fulfilled at another location or transaction point? Not every location you design for will have optimal transportation in place, how it gets there will impact your design. If packaging will be transported separately from the product there may be added benefits to designing structures that can be transported flat. 8. Understand the environment in which end users will interact with your packaging. - What are the shelf requirements? - Shelf placement, high, low, end-cap? - Who does it compete against on shelf? - What type of lighting is used? 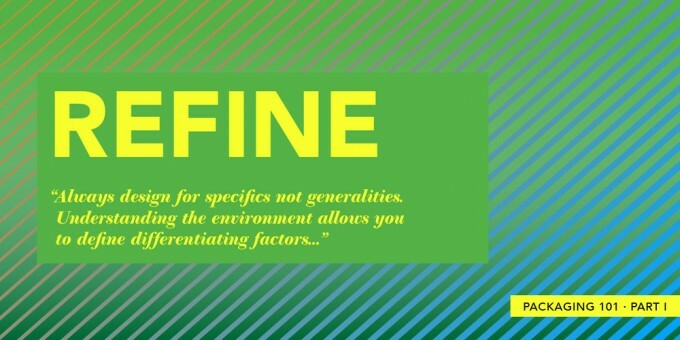 Always design for specifics not generalities. Understanding the environment allows you define differentiating factors by focusing on color, shape, then message in that order. Dr. Nona Woolbright suggests, requesting the retailer’s numerical spectral color data, which will allow brand managers to view the packaging in the same lighting conditions as they will appear in the retail space. - How will the product ship? In branded packaging or third party packaging? - What are appropriate brand cues to be delivered at a kitchen table? - What are key factors in creating brand appropriate share-worthy packaging? Considering that e-commerce packaging is experienced long after the excitement of the purchasing process, it must deliver a brand appropriate presentation to reignite the emotions connected to the online experience. Here’s a quick guide that may help in selecting brand appropriate packaging cues. If like many of today’s products, consumers will be interacting with the packaging in both retail and e-commerce, you need to prioritize and further define the end-user experience. 9. Establish Packaging Goals & Hierarchy. - Does the packaging have to sell, warn, or display? - What legal information must be represented on the pack exterior? Setting defined roles and responsibilities early in the process helps to manage expectations and reduces those unforseen timeline impacting decisions.